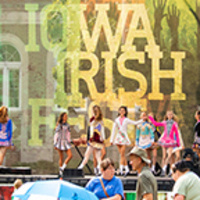 The Cedar Valley Irish Cultural Associationis holds Annual Iowa Irish Fest in and around the Lincoln Park area including East 4th and Mulberry Streets in downtown Waterloo. Iowa’s largest Celtic festival boasts of four stages of music and entertainment. Celtic gifts, food, and highland games. There is a large family area for little ones, 5K walk/run on Saturday morning, and a outdoor Mass on Sunday You don't have to be Irish to attend but you'll wish you were when you leave.